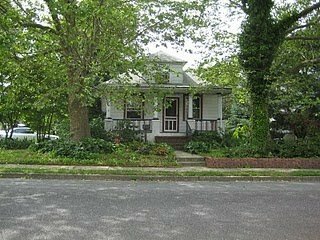 I pulled this picture off-line, but it is the exact same outside as my father's Magnavox. Apparently, the model name was "The American." These old things are selling now for around $500 whether they work or not. Question: Can you still get tubes to repair them? The set-up in dad's Magnavox was a little different than this one. 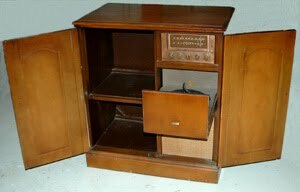 The drawer where the record player comes out was actually on the left, and the top was split so that the side that had the record player (the top cubby-hole) lifted up in order to put the records on the spindle. 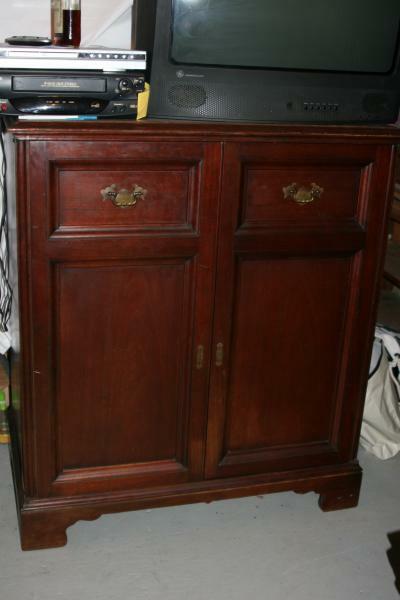 Where you see the record player drawer, was where the speaker was housed. The bottom-left cubby-hole is where he stored his favorite, or the children's favorite records. I was a small child when my father bought himself a very large Christmas present. "Rose" he said, "Listen to this." Well, listen she (and we) did! 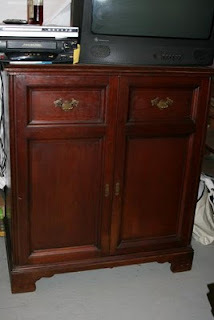 Daddy bought himself a Magnavox High Fidelity combination radio/record player in a beautiful mahogany cabinet. Where he got the money for it, I haven't a clue, except he bought it the year his step-mother died. And, I, being too young to understand things such as inheritances just assumed daddy had bought himself a wonderful gift. But was it so wonderful? Well, for dad, it was. But, I think one of his purposes was to either drive me (and my mom) nuts, or make us deaf. The deafness certainly has come to pass for me, and before he died himself. Anyway, this wonderful radio/record player combo was a real boon for our family. I recall listening to "I Love Judy" on Sunday evenings, watching the radio, and visualizing all that was being done and said on that show. Each evening we would gather for at least one radio show and I and my sister would sit on the floor right in front of the radio and listen to the show, transporting ourselves into the box, and seeing those wonderful programs such as: The Shadow Knows; The Lone Ranger; Sergeant Preston of the Yukon -- those were my favorites. And the records: Dad signed us up for the Big Jon and Sparky record club and each month we would get a new record which was either a story or a set of songs related to the program. We just loved those records and they were in different colors, not just black. Dad's Christmas tradition, and here's where the deafness comes in, was to play the Messiah on Christmas morning. He would turn the bass up (or down) to it's fullest., and turn the volume up as far as he could get away with before my mom went over and not-so-gently turned it down. After all, we has four screaming, over-active children in a very small house, who had just opened their Christmas present. More noise we didn't really need. "Listen to this, Rose." Bass turned at full blast, floor shaking, he would sit in his captain's chair by the Magnavox and seem to be in bliss as he shook along with the floor as the music emanated from the record player's speaker. Of course, the bass on that machine was nothing compared to what came out later in the 20th century, but dad sure did enjoy his Magnavox through the years. And so did we.